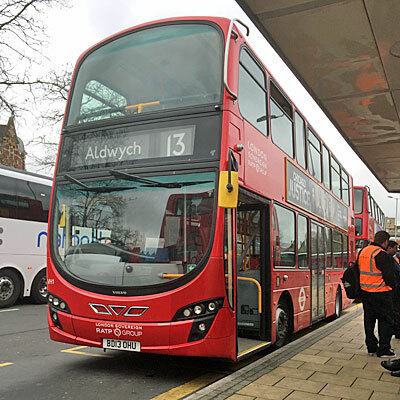 The number 13 bus has been running from Golders Green to Aldwych since 1970 (and from Golders Green to central London since 1952). It runs via Finchley Road and Baker Street, before nipping down Oxford Street, then Regent Street, then round Trafalgar Square and up the Strand. It's been doing this for years. Tomorrow it won't be doing this any more. Stop panicking, said TfL, we know what we're doing. Bus route 82 already runs along the majority of this route, indeed all the way from Golders Green to Baker Street, so you can catch that instead. 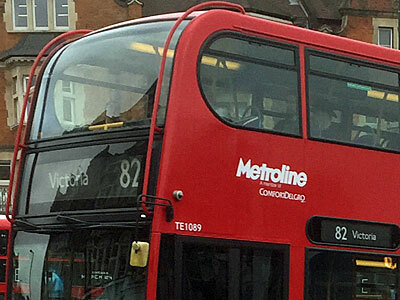 What's more the 82 starts in North Finchley, which is better, and it goes to Victoria, which is still in the West End, so what's the problem? Having said that, we do recognise that this change is contentious, so we won't scrap route 13 after all, we'll go away and have a think. What we're going to do, they said, is extend the starting point for route 13 back to North Finchley, and divert it to Victoria at the southern end. This way we haven't scrapped a much loved bus route, we've made it better. And then we're going to scrap route 82 instead. There was again a furore, though not quite such a large one. Local residents were angry, local MPs complained, and one politician gathered a petition with 1870 signatures. We see what you've done, they said. You're planning to rename the 82 bus the ‘13’, and then remove the 13 bus route by stealth. It's exactly the same plan as before, but with the numbers swapped. Ha, said TfL when the consultation closed. Only 32% of you supported or partially supported our proposal to extend route 13 to North Finchley and re-route the service from Aldwych to Victoria. And only 26% of you supported or partially supported our proposal to withdraw route 82. But we're going to do it anyway. TfL said their proposals "were made in light of a significant and sustained change in passenger demand, and were designed to better match demand to capacity." They said their proposals "were designed to help ensure our financial resources were being used in the best way possible." And they said their proposals "took into consideration recent improved services on the Tube and London Overground, the forthcoming introduction of the Elizabeth line and the introduction of the one-hour “Hopper” bus fare, which has proved incredibly popular." Basically TfL said they can't go running empty buses where they're not needed, there isn't the money. Also they said they'd reinvest the money in other bus services in outer London that are well used. But mainly they said it's now free to change buses, thanks to the “Hopper”, so even if you have to change buses it won't cost you extra. Expect to hear a lot more of these three arguments over the years to come. And the end result is that the number 13 bus route is being scrapped, but the number 13 route number isn't. What's called bus route 82 today will be bus route 13 tomorrow. Route 82 no longer runs. Route 13 is extended from North Finchley and rerouted at Oxford Street to Victoria to replace it. I should point out that TfL will be increasing the frequency of route 13/82 from once every eight minutes to once every six minutes, so the total number of buses hasn't plummeted and it should still be possible to get on board at peak times. I should also point out that there will also be tweaks to routes 113, 139 and 189, which I haven't gone on about here. But the overall effect is a cut in peak frequencies on Finchley Road from 27 buses an hour to 22, whilst maintaining the illusion that the number 13 bus still exists. I took a ride on the doomed number 13 bus earlier this week. I saw no information on any bus stops about the change, save in the bus shelter at Golders Green where the bus currently starts. The electronic displays inside the bus gave regular reminders to check tfl.gov.uk/buschanges, but didn't tell anyone without a smartphone what the upcoming changes actually were. The Men Who Change The Tiles had been out early - too early - removing 82s from numerous bus stops and replacing them with shiny new 24-hour 13s. And I had a nice ride, to start with at least. All the way to Baker Street the journey on the 13 bus was fairly smooth. Even Oxford Street was fine (it's worth pointing out that one of the reasons the 13 is being scrapped is to ease congestion here). But Regent Street was a nightmare, a snail's pace jam of red buses, and most of these I noted were pretty much empty. Indeed when we finally reached the Strand, I observed that three consecutive number 13 buses going the other way had no passengers on them at all. This is another reason why the West End end of the number 13's route is being scrapped - there are far too many buses in central London moving too slowly with too few people on board. The number 13 bus was doomed in this modern cost-cutting climate because it did nothing unique. North of Selfridges it was shadowed perfectly by the 82, and east of Selfridges it was shadowed perfectly by the 6, the 23 and the 139. Why run a bus that merely copies others, especially now changing buses is free? That's why the number 13 bus route is being scrapped tomorrow. And devious scheming is why the number 82 dies instead. As my randomly-dealt tour of hypothetical London continues, I've turned over the fourth and final Three in my pack of cards. That means Ealing - not the current London borough, but the Municipal Borough of Ealing, to which the Municipal Borough of Acton and the Municipal Borough of Southall were subsequently bolted on. 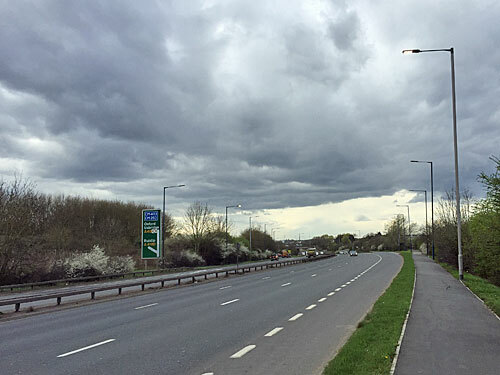 For my post today I've decided to walk the breadth of the old borough along Western Avenue, better known as the A40, a six lane dual carriageway. You might be better off driving it to enjoy the following sights, rather than subjecting your lungs to five miles of exhaust fumes. The Ealing stretch of the A40 starts outside Park Royal tube station. It'd be East Acton on the current boundary, but the original dividing line was Green Lane, now reduced to an alleyway up the side of the Piccadilly line. That's no great shakes, but my word the station building is magnificent, an art Deco confection with geometric shapes stacked in red brick, with the contrast between cylindrical ticket hall and clocktower a particular highlight. The adjacent shopping parade was erected in similarly streamlined style, now an odd mix of supermarket, Boden outlet store and boarded-up nightclub. 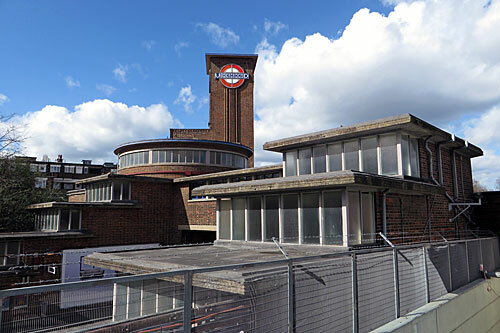 It's only a short walk to Hanger Lane tube station, not quite the architectural equal of its neighbour but still with an alluringly circular facade. Opened just after WW2 rather than just before, it was once the dominant feature at the crossroads where Western Avenue met the North Circular. The creation of the infamous Hanger Lane Gyratory in the 1980s saw the station marooned on a central island, so access is now via a tiled subway whose signage might leave you wondering where on earth the ticket hall is... until you spot it up one arm from the central atrium. Here goes with the arterial slog. The A40 sweeps down from Hanger Lane into the valley of the River Brent, past a row of well-glazed houses on Greystoke Park Terrace and some allotments where St George's flags limply flutter. Nip into Brentham Meadows for a brief break from the traffic, and take a peek at the not-quite scenic river curving beneath the main road in a concrete channel. This is also the point to check out what amazing object the Vanguard Self Storage company has on its roof at the moment. In the past it's been an artillery gun, a single decker bus or a Hawker Hunter jet, but currently it's a Tardis (if you're the Londonist muppet responsible for tweeting four-year old posts, take note). The highlight of the entire road trip is, or ought to be, the Hoover Building. This Art Deco masterpiece was opened in 1933 for the manufacture of vacuum cleaners, with pillared glass facade and Aztec-style detailing. Tesco bought up the factory space in 1989, and now operate a improbable supermarket round the back, while the offices have lain dormant (and decaying) for years. In a move that'll surprise nobody, they're now being transformed into 66 luxury apartments with contemporary interiors, bespoke kitchens and gated underground parking, in a postcode "yet to fully maximise its real estate potential". Mass scaffolding and one of the tallest cranes in Ealing mean that 2017 is not the ideal year to admire the building. Perivale's 12th century flint church has been severed from the community by the A40, swallowed by a golf course and hidden behind a Premier Inn, which aren't factors conducive to a large congregation, so since 1972 it's been run as an arts centre rather than a place of worship. Last night at St Mary's Perivale you missed Grieg's Peer Gynt Suite, while the The Lipatti Piano Quartet are playing Mozart and Schumann on Sunday. 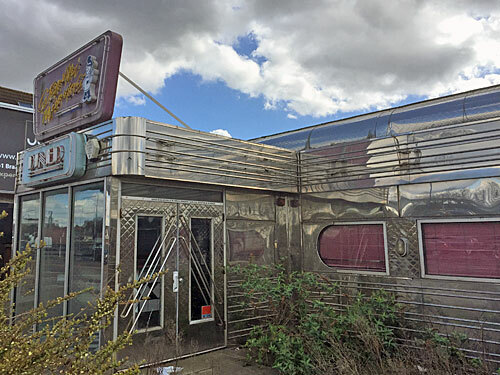 Beside the petrol station is the equally unlikely sight of a shiny American diner, formerly Starvin Marvins, although the doors are bolted, the lights are off, the red leather chairs at the counter are empty, and a 2015 diary sits forlornly on the laminate. For those on foot or two wheels, the A40 is quite difficult to cross, with a minimal number of subways, bridges or at-grade junctions. There's a rare set of traffic lights at Argyle Road, plus a footbridge by the railway near Perivale Park, which you'll have negotiated if you've ever walked the Capital Ring. Up on the embankment is the third least used station in London, South Greenford, or 'West Perivale' as the marketeers at the Hoover Building prefer to call it. Not much investment has been sprinkled at this lowly halt, which helps to explain why the signs outside still promise "All stations to Ealing Broadway/London Paddington", when in fact the service was cut back to West Ealing at Christmas. 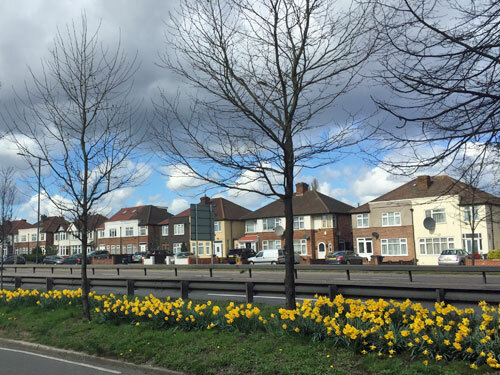 Even though nobody would build homes facing onto a six lane dual carriageway today, ribbon development was very much in vogue when Western Avenue was constructed in the late 1920s and early 1930s. 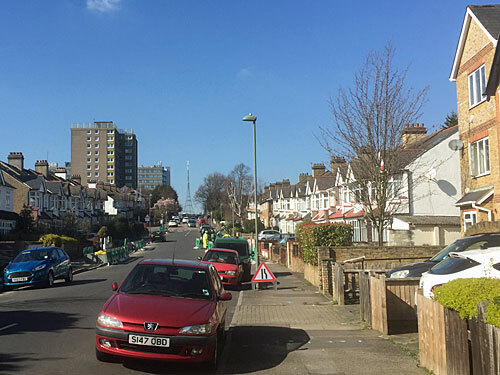 Residents of the appositely-named Leaver Gardens look out onto a verge of daffodils, a screen of trees and a series of crash barriers, and one house boasts a 'Corporation of Ealing' manhole cover in the pavement outside. Meanwhile guests at the Bridge Hotel may not be overkeen to discover that their rooms look out onto the Greenford Flyover (rather than the bridge the original pub was supposed to be named after, which is two miles away in Southall, except in 1937 the joint owner accidentally transposed the names when filling in the licence forms). The next mile and a half of the A40 is actually rather pleasant to walk, thanks to the Northolt and Greenford Countryside Park which runs alongside. The footpath weaves behind a screen of trees beside the Greenford Lagoons, where tall grasses wave, before opening out into the more extensive Marnham Fields. 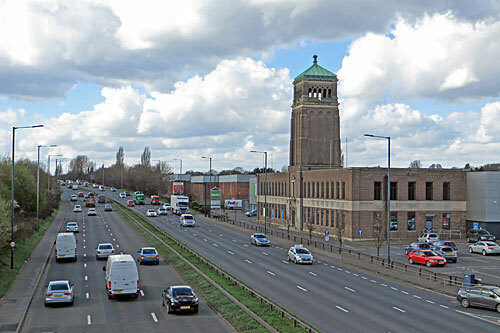 Across the road is the striking Aladdin Tower, once part of a lamp factory (obviously), more recently requisitioned as a warehouse-sized branch of Dunelm, the soft furnishings company. Where the Grand Union Canal ambles through the park you could almost believe you were in the country, assuming you had your headphones on. The 21st century highlight of the walk is Northala Fields, Ealing council's flagship post-millennial recreational project. 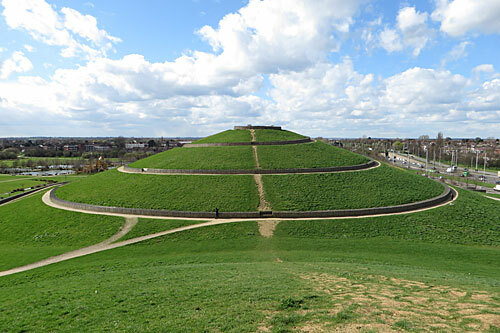 There's a park and a cafe and a fishing lake, if that's your thing, but far more fabulous are the four conical hills made from half a million cubic metres of waste dug up during the construction of Wembley Stadium and Westfield. The tallest has a spiral pathway to the summit, at a wheelchair-friendly gradient, whereas the others are brief exhilarating scrambles. And the view is fantastic, there being nothing else of any comparable height around, my personal favourite being to the east (in the direction of the road just walked). From here central London's skyscrapers line up mostly unobscured by one another (apart from One Canada Square behind the Trellick Tower), currently with a burst of spring blossom in the foreground. Northolt's Target Roundabout is named after another huge traveller-friendly 1930s pub, this time transformed into a McDonalds, because scoffing burgers is safer than drinking and driving. From here the A40 descends into open country, not that you can see the golf course on the left, but Islip Manor Meadows are pre-eminent on the right. These scrappy inaccessible fields look like they ought to be prime candidates for extensive residential development, but are actually a wetland nature reserve with a diverse ecology, including sneezewort, devil's-bit scabious and the EU-protected great crested newt. The Ealing section of Western Avenue halts suddenly several hundred yards before the Polish War Memorial, a far from ideal place for a walk to end, not that an arterial road is ideal for a walk in the first place. 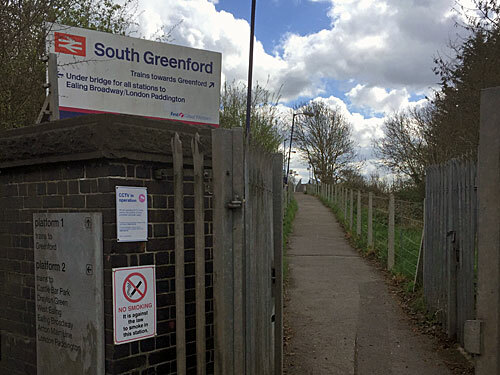 But even if you have the sense never to repeat all that I've done, an exploratory stroll from Greeenford to Northolt via the A40 wouldn't be the biggest mistake you've ever made. £1) The one pound coin was introduced on 21st April 1983 (the Queen's 57th birthday). £2) Last year it was estimated that there are 1671m one pound coins in circulation. £3) There are more one pound coins in circulation than £2 coins (479m) or 50p coins (1053m). £4) There are fewer one pound coins in circulation than 20p coins (3004m), 10p coins (1713m), 5p coins (4074m), 2p coins (6174m) or 1p coins (11430m). £5) One pound coins make up 5.5% of all the UK coinage in circulation (but 36% by value). £6) Of all the old one pound coins that have entered circulation, 19% are dated 1983, 6% are dated 1984 and 10% are dated 1985. £7) Only 0.3% of one pound coins are dated 1988 (these show the Royal Shield). £8) No one pound coins entered circulation in 1998, 1999 or 2016. £9) Four different royal portraits have been used on the old one pound coin. £10) In May 2015 it was estimated that 2.55% of UK one pound coins in circulation were counterfeit (compared to 3.03% a year earlier). £11) One good way to spot a counterfeit one pound coin is to hold it upright and spin it round. If the orientation of the obverse and reverse designs is not in line, you've got a fake. £12) The words around the rim can be either way up, this is purely random. £1) The design of the 'tails' side was changed each year from 1983 to 2008 to show (in sequence) an emblem representing the UK, Scotland, Wales, Northern Ireland, and England (together with an appropriate edge inscription). £2) From 2008 to 2015 the Royal Arms was used each year, plus two additional national designs in 2010/11 and 2014/15. £3) The Royal Mint has produced a list and a full infographic showing all of the UK's £1 Coin Designs - how many can you find in your change? £4) The most common design in circulation is the Royal Arms, which appears on 26% of coins. £5) 29% of coins show 'national plants', 20% show 'national symbols', 9% show 'national bridges' and 0.5% show 'coats of arms of capital cities'. 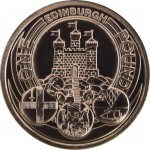 £6) The least common design in circulation is the coat of arms for the city of Edinburgh, minted in 2011 (only 935,000 were made). £7) There are four times as many Welsh leeks as English oak trees in circulation. £8) There are more Menai Bridges than all the other three bridges put together. £9) The legend DECUS ET TUTAMEN (meaning "an ornament and a safeguard") was first used around the rim of pound coins minted in 1983. 60% of one pound coins bear this legend. £10) The unintentionally-appropriate legend PRO TANTO QUID RETRIBUAMUS (the motto of the city of Belfast) was only used in 2010. £11) Between 2004 and 2007 no words appeared around the rim of a pound coin, only "an incuse decorative feature symbolising bridges and pathways". £12) Last year the 25th (and final) 'round pound' design was struck, but did not enter general circulation. It shows four royal beasts surrounding Edward's crown, and was designed by the Bishop of St Asaph, the Rt Revd Gregory Cameron. £1) The new pound coin will be the first 12-sided coin since the threepenny bit, last minted in 1970. £2) The corners are rounded, using ‘radial chords’. Six of the twelve sides are milled, and the alternate six are smooth. £3) Some new one pound coins will show 2016 as the year of manufacture, apparently, despite not coming into circulation until 2017. £4) The 'tails' side of the new one pound coin shows a rose, leek, thistle and shamrock emerging from one stem within a royal coronet. The designer was schoolboy David Pearce from Walsall, then 15, now 17. £5) If Scotland ever leaves the UK, presumably a new design will be required. £6) The new one pound coin is made in Wales. £7) The new one pound coin is bimetallic. The outer ring is gold coloured (nickel-brass) and the inner ring is silver coloured (nickel-plated alloy). £8) The new one pound coin has a "latent image" (like a hologram) which changes from a ‘£’ symbol to the number '1' when the coin is seen from different angles. £9) The new pound coin has very small "micro-lettering" on the lower inside rim on both sides of the coin (ONE POUND on the 'heads' side, and the year of production on the 'tails' side). £10) The new one pound coin has a top secret patented High Security Feature built in, "to protect it from counterfeiting in the future." £11) The new one pound coin was first released to collectors, as part of a commemorative set, on 6th March 2017. £1) The old one pound coin weighs 9.5g. The new one pound coin weighs 8.75g. £2) The old one pound coin has a diameter of 22.5mm. The new one pound coin has a diameter of 23.43mm from point to point, and 23.03mm from edge to edge. £3) The old one pound coin has a thickness of 3.15mm. The new one pound coin has thickness of 2.8mm. £4) The old one pound coin was 70% copper, 5.5% nickel and 24.5% zinc. The new one pound coin is 76% copper, 4% nickel and 20% zinc. £5) The queen faces right on coins (but left on stamps). King Charles will face left. £6) One pound coins are legal tender in any amount (whereas 50p and 20p coins are only legal tender up to £10, 10p and 5p coins only up to £5, and 2p and 1p coins only up to 20p). £1) A "co-circulation" period exists from 28 March to 15 October 2017. £2) During the co-circulation period, machines should be able to accept both forms of coin (but might not be able to). £3) The legal tender status of the old one pound coin will be withdrawn on 15th October 2017. £4) "Demonetisation" begins on 16 October 2017, from which date businesses are under no obligation to accept the old one pound coin from their customers, but it can still be deposited into a customer's account at most High Street banks. £5) Old one pound coins will be melted down to help make new one pound coins. £6) You have 201 more days to spend your round pounds. Opening sentence referencing the location of today's post. Acknowledgement that I have been here before, with link to previous article should you choose to compare and contrast. Recognition that not many Londoners have been to this place. Specific mention of the name of the place in the hope that at least one person leaves a message in the comments saying they used to live here and they remember one of the shops, while another says they live here now and it's not as awful as most people think. Link to Wikipedia article. Slight teaser. Brief paragraph devoted to background history, seriously condensed so as not to slow down the flow of the post. If you go back far enough this was all fields, obviously. A follow-up sentence which sprints from the Georgian era to post-war development, via something vaguely interesting the Victorians did. Brief mention that things changed dramatically when the railways came. Several peripheral facts deliberately omitted, so that someone else can look clever by telling us all. Reference to establishing landmark, and link to map of the area should you be wondering where it is. Mention of nearby railway station, because that'll probably help you to understand where this is without clicking on the map link, because nobody clicks on links. Twinge of regret at mentioning the railway again, because this may trigger a long comment about trains, despite trains not being the main focus of the post nor mentioned in any other context. Description of the type of housing nearby, admittedly not using the finest architectural terms but sufficient to get the gist across. Rather too many thesaurus-friendly adjectives all crammed together into the same sentence, which drones on rather longer than it should because I forgot to read it back after I'd written it, which is never wise, and probably containing one clause too many. Glaring factual error. Namecheck for local cafe, not that I went in, but normal people might. List of three types of shop, selected for their collective stereotypical nuance, in the hope that this helps give a flavour of the kind of person who lives and shops here. Observation that something old has now become flats. Tone of voice tempered according to whether the old thing was merely adapted to create flats, or completely knocked down so that developers could start again and build something out of proportion with all the good looks of a shed. Moving off from the starting point along some specifically-named road, in case you were ever to want to repeat my journey, which you never will. Something I overheard somebody saying as I walked by, because it's quite funny out of context. Silent recognition that this is entirely irrelevant, apart from adding a bit of local flavour, but it does prove that I did actually cross London to visit this location rather than sitting at home and sourcing all my photos from Streetview. Ordinary-looking house which it turns out has an interesting history, but only if you're a keen fan of one particular 1980s sitcom, or have a thing for mass poisoners. Worrying feeling that this building is why I crossed London to visit this location, and after all that effort it's only an ordinary-looking house. Attempt not to mention the address in too specific a manner in case the owner of the house ever Googles it and discovers I was the nutter taking intrusive photos of their front garden. Incisive observation which deserves to be a single paragraph all by itself. Second building notionally just round the corner from the first, but potentially half an hour away on foot. Short synopsis of the building's history, all gathered from the internet after I got home because I never realised how rich its background was while standing in front of it. Detailed description of the chimney, the front door or some other entirely irrelevant feature. Sentence including speling mistake which my proof reader will email me about within 20 minutes of the post going live. Grim footpath up the side of the building - a route taken solely for dramatic effect. Trying hard to think of another synonym for footpath which I haven't used three times already. Mention that the local park is full of trees, which obviously it is, but the appearance of leaves and/or blossom permits a little seasonal flavour. Sentence including word which doesn't actually exist, but you should be able to work out my intended meaning, and I think I'll get away with it. Obligatory visit to local viewpoint, be that hilltop, embankment, mound or footbridge. Repeated over-use of the words view and panorama. Mention of whether or not you can see the Shard, because again this proves whether I actually went or not. Obligatory visit to local waterway, be that stream, canal, ugly concrete culvert or lost river. Mild excitement if 'lost river' category can be correctly utilised. Description of at least one thing seen dumped in water, for same reason as previously. Downbeat reference to proposed development of flats in that new brick vernacular. Recognition that yes, flats are needed, but surely we can do better than this. Trigger vocabulary used to ensure that at least one person in the comments questions what percentage will be affordable, and then bemoans the direction the modern world is travelling in. Oblique mention of Brexit merely to piss off one of my angrier readers. Penultimate paragraph starting to tie everything together, and an excuse to link to posts other people have written which reference the general area I've just visited. Sentence which would read more clearly if it didn't keep changing colour because I'm linking to some photographs you won't look at. Opportune moment to mention a local bus route which might deliver you here quite easily, but best not, because commenters are even more likely to write something tangentially historical about buses than they are about railways. Repeated admission that this is not the most exciting area of London. Tacit acceptance that my post has probably confirmed this in your mind. Acknowledgement that you could one day come here and see what I've seen but you won't. Unspoken feeling that surely I must have better things to do with my weekends. Assumption that I will one day be back. Concluding sentence incorporating limp pun. Now, what's in the comments? As we edge into British Summer Time, is your sunscreen ready? London's just entered the half of the year when the sun's rays are strong enough to cause skin damage. Indeed this is the very week when the UV Index ticks up from definitely 'Low' to potentially 'Moderate'. To help demonstrate this, here's a graph showing the UV Index in sunny London yesterday. 0-2 Low You can safely enjoy being outside. 3-5 Moderate Stay in the shade near midday, wear protective clothing, apply sunscreen. 6-7 High Reduce time in the sun, wear protective clothing, apply sunscreen. 8-10 Very High Minimise time in the sun, wear protective clothing, apply sunscreen. 11+ Extreme Avoid time in the sun, wear protective clothing, apply sunscreen. n.b. If you have lighter or darker skin colouring than average, click here for a reassessment of your risk. I'm fortunate enough to tan rather than burn, so for me the danger kicks in at 5 rather than 3. The UV Index is a global scale, so scores of 11 and above tend to occur in the tropics. 10 is the maximum midsummer value in Toronto, where the UV Index was devised. In the UK we rarely go higher than 7, with 8 possible in late June in Cornwall and the Channel Islands. I've long wondered how the UV Index is calculated, so have done some digging, and I can confirm that it's very complicated. Specifically a computer model is required to relate a) the strength of solar ultraviolet radiation, b) the concentration of ozone in the stratosphere, c) the amount of cloud in the atmosphere and d) the elevation of the ground. For the latter, UV intensity increases by about 6% for every 1000m above sea level. As for clouds, clear skies allow virtually 100% of UV to pass through, scattered clouds transmit 89%, broken clouds transmit 73% and overcast skies transmit 31%. This is why the UV forecast varies so much. But it is possible to simplify things by ignoring actual weather conditions and focusing on what would happen in one place if there were clear skies. This splendidly basic website (circa 2003) allows me to calculate the maximum UV Index at any point on the globe at any time on any date. I've chosen London, obviously (other locations further north or south in the UK would be little different). Assuming clear skies in London, what's the UV maximum at different times of year? My first table shows the maximum UV Index in London at noon on the 21st day of each month. That's solar noon, the point when the sun is highest in the sky, which is around noon in the winter months and around 1pm in the summer. Theoretically, this is the highest the UV Index can reach. I've calculated the numbers to one decimal place. If you look at the green entries you'll see that the maximum UV Index is 'Low' for half of the year, from the start of autumn to the end of winter. Specifically the UV Index in London is always below 3.0 from 22nd September to 23rd March, which is why you haven't needed your sunscreen for the last six months. But last Thursday was the first day with a theoretical maximum in the yellow zone, and by May we'll be up into the oranges. Specifically the UV Index in London can be 6 or more from 13th May to 31st July. Notice that in this theoretical model London never quite reaches 7, although in reality certain atmospheric conditions can tip the index this high. 'Moderate' UV levels kick in when the sun is more than 40º above the horizon, which happened for the first time this year at noon last week. Because the UV Index varies with the height of the sun in the sky, the maximum varies considerably according to the time of day. At dawn the UV Index is always 0 because the sun is on the horizon, and then on a cloudless day it rises through the morning and falls away in the afternoon. My next table shows the maximum possible UV Index in London at various times of day on the 21st day of each month. I've only considered the spring and the summer - the rest of the year is all green. To keep things simple I'm using whole numbers. Note that all the times in March are GMT, and from April onwards they're BST. The first column is for last Tuesday, and shows how the UV Index rises to 2 between 10am and 2pm, but never quite reaches 3. The second column is for 21st April, which shows a 'Moderate' risk kicking in by 11am and remaining until 3pm. In May, June and July, a 'High' risk exists between noon and 2pm, with a 'Moderate' risk between 10am and 4pm. All of this assumes a clear sky, with lower values in case of cloud. But this helps to explain why you burn in the summer (either side of the solstice) and not in March or September. This next table I'm calling my You Might Burn table. It shows the calendar dates when a certain UV Index is possible for a prolonged length of time. For example, I'm particularly interested in a UV Index of 5, because that's when my skin becomes susceptible to burning. I need to watch out between noon and 2pm from the end of April to the middle of August, and between 11am and 3pm from the middle of May to the middle of July. But if your skin burns when there's a UV index of 3, you might need to slap on sunscreen between noon and 2pm starting this week, between 11am and 3pm starting in a fortnight's time, and between 10am and 4pm from the beginning of May. If that was a bit confusing, try this. My final table shows the potential danger periods on the 21st day of the month over the summer. The times are a little more approximate here. Again the data is for London. On 21st April a UV Index of 3 is possible from 10.30am onwards, and 4 from 11.30am to 2.30pm. By the time we reach 21st May, the UV Index could be 5 from 11am onwards, and 6 from noon to 2pm. The peak risk is on the day of the summer solstice, with the UV Index above 3 for almost the entire working day. That's assuming it's perfectly sunny, of course. A more typical British summer's day wouldn't be quite so intense. If you're still with me, I hope that all this research and number crunching has been interesting. It's been reassuring to discover that there is genuinely no need for sunscreen in London between late September and late March. It's been a salutary reminder that it'll soon be time to get the sunscreen out again, or face the consequences. And it's helped me to understand why I got the worst sunburn of my life in San Francisco even though it was only April (it never gets to 7.5 in London, but it does over there). If I could offer you only one tip for the future, sunscreen would be it. 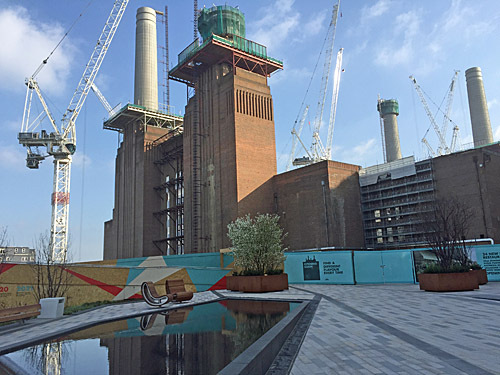 Although the revamped Battersea Power Station isn't due to reopen until 2020, a scrap of landscaped riverfront has reopened alongside the first adjacent flats. As yet there's bugger all to do apart from own an apartment, or gawp, but by the summer several shops, restaurants and cafes will have moved in and Circus West Village will have been born. The marketing team describe this as "London’s newest food destination", which vastly overstates the scale of what's planned, but it is already possible to wander in off the street and see for yourself. The sole access point, at present, is on the south side of Chelsea Bridge, immediately opposite the entrance to the (much more enjoyable) Battersea Park. 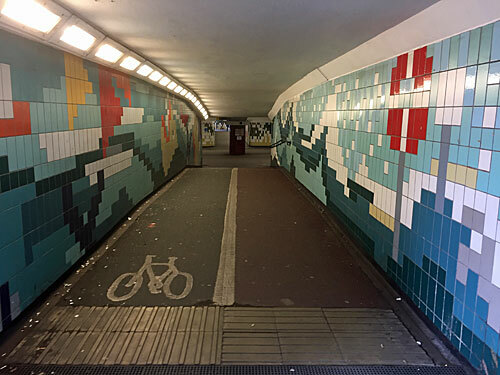 Proceed past the bastion of Berkeley Homes and the private clinic to reach the underside of Grosvenor Bridge, part of the main railway out of Victoria station. Here a security guy will eye you up and down in case you're undesirable - don't worry, they didn't mind me, you'll pass. 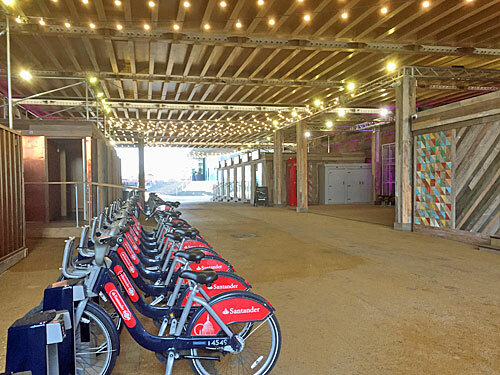 A cycle hire stand is already up and running beneath the fairy lights, as well as a red telephone box with a touchscreen video display inside. The volume's a bit too loud and the sound distorts, but the films and stories about the power station are nicely done. Come back soon and the adjacent temporary exhibition space should be ready - they were still putting up the panels when I passed by. But don't expect to read anywhere about just how many trains rattle by and quite how close. If it's half as loud in the adjacent flats as it is under the arches, I'd recommend buying a property elsewhere. Step through and you're in Circus West Village proper, if it's right to describe a piazza overlooked by a wall of glass as a village. I'd say it isn't, but that's not the only delusional claim round here. 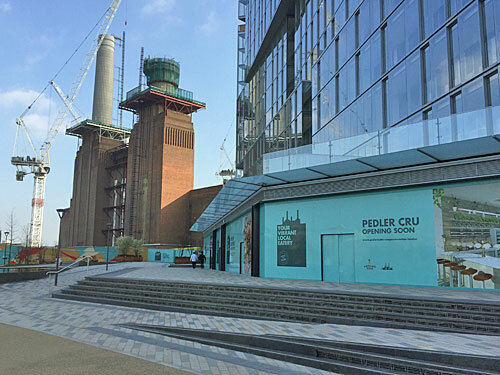 In what is one of the most important years in the history of Battersea Power Station, the Battersea Power Station team is pleased to confirm the first new shops, restaurants and cafés moving into the first phase, Circus West Village opening summer 2017. The pedestrianised 'street' to your right is currently sealed off while the individual railway arches are fitted out. One will be a sourdough pizzeria, another a gin distillery attraction, another a brunch'n'burger canteen. 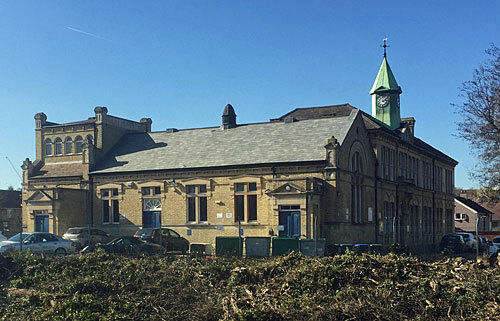 There'll also be a Village Hall, designed as a community hub in conjunction with the excellent Battersea Arts Centre, although I suspect most future residents will be more at home in the oyster restaurant round the corner. 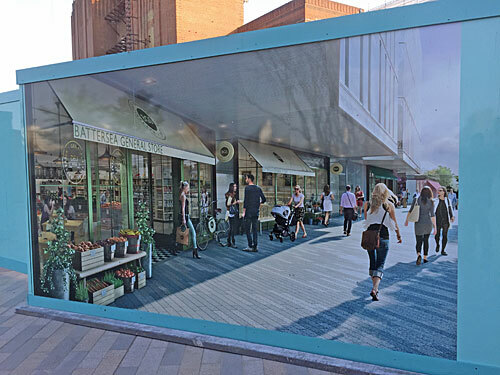 You can get a fairly good idea of the intended populace from a massive illustration near the Marketing Suite depicting an everyday scene outside the 'Battersea General Store'. Every single person in the picture is white, every single person in the picture is under 40, only three are male... this place aims to be the unashamed epitome of nouveau posh. Circus West is the reason you can't see the power station from the railway any more, a residential block longer than the Shard is high, perched on top of a two-storey commercial podium. Residents in the prime Thamesside flats have a fully-glazed conservatory where you'd expect to find a balcony, a narrow sun trap which unfortunately faces north so won't be seeing a lot of sun. Underneath will be the boringly-titled No 29 Power Station West, described on its hoarding as "a pub for the 21st century", although the artist's illustration outside better resembles a posh Georgian drawing room. Meanwhile "Your Vibrant Local Eatery" will be hosted by Pedler Cru, while the final unit is marked "New Exciting Concept Coming Soon" which can only mean it hasn't been successfully let. Given that nothing retail is open yet, best make the most of the available public realm. A fang-shaped piazza rises up towards the dead-end edge of the power station, with semi-stepped terraces and gently sloping paving. Its most impressive features are two geometric pools, mirror-flat unless it's windy, with water gently cascading over the rim into unseen drains. A handful of swish chunky wooden chairs have been provided alongside each, an ideal amount of seating for current visitor levels, but likely to be overwhelmed later. For now the highlight is the opportunity to see the old electric cathedral up close. Its lofty facade looms over all, with two chimneys rebuilt, another nearing completion, and the last original now demolished. Only the shell of the power station building remains, with a new penthouse roof yet to arise, and with offices, cinemas and other commercial magnets destined to be slotted within. Circus West Village is only a tiny fraction of all that's planned, but probably a good indication that this extensive redeveloped quarter of SW8 will be somewhere to enjoy spending your money, assuming you have more than enough. A painted hoarding blocks off access to what will eventually be Power Station Park, six acres of partially-turfed open space adjacent to the Thames. 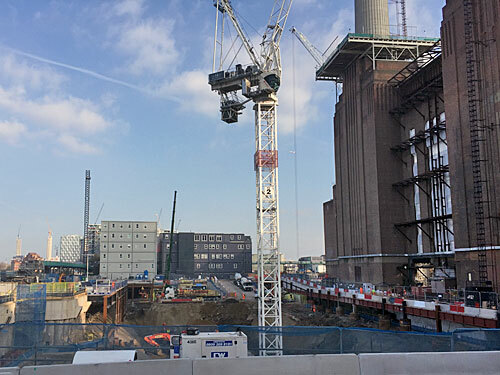 Its main purpose is to ensure that there's at least one direction from which the silhouette of Battersea Power Station is still visible, rather than being smothered by a fortress of residential development. For now however the park is a huge deep hole in the ground, as can be seen if you climb a brief ramp and peer over the side. What the hell will they be burying down there, will it be basements or utilities or car parking, or is it simply currently a very useful place to plonk a crane? 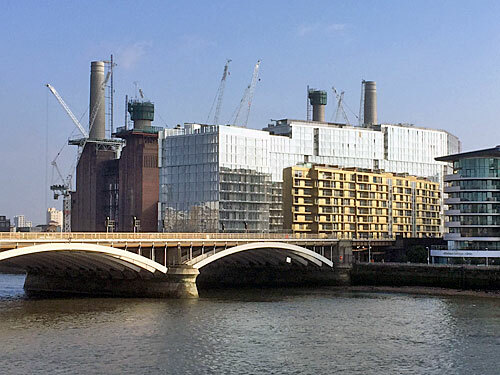 One day the entire Thames waterfront will be opened up, connecting Battersea Bridge to Vauxhall Bridge along the south bank of the river for the very first time. Later this summer Thames Clippers will be dropping by, as part of a fresh waterbus connection to the centre of town. And this weekend you can come down and see for yourself, as part of a special Mother's Day event with free pizza, free coffee, a performer with a big hoop and some bubble mixture, and a biscuit decorating drop-in workshop. I say don't rush. But you will be down here eventually, the whole of London will be down here eventually, so why not get the heads-up early? Early afternoon, one day later, Westminster Bridge. Both ends have been sealed with white tape, which flaps feebly in the wind. Normally the silhouette of the bridge has vehicle sized humps, and tiny people rushing by, but today's it's flat. 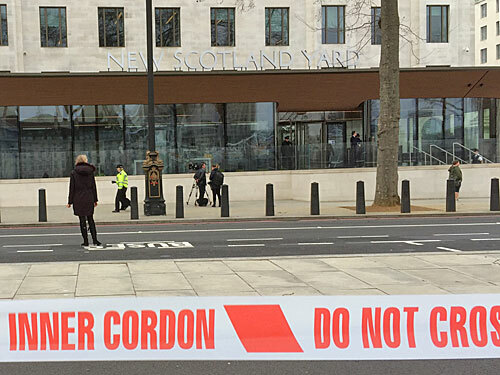 Occasionally the cordon is detached to allow officialdom to pass through, but ordinary people are held at bay by a polite stare, and advice on the best route for negotiating round the disruption. Tourists are streaming back to visitor attractions on the Albert Embankment, brandishing their tickets to the London Dungeon, milling on the steps into the London Aquarium and stuffing themselves with a Big Mac in lieu of lunch. The London Eye is turning again, with queues undaunted by yesterday's extended spin. Foreign camera crews are poised by the river's edge, explaining to the audience back home what's going on, with Parliament framed on the horizon. On the north bank a police officer reels in the plastic ribbon blocking the Cycle Superhighway as a flow of pedestrians streams by. Initially only a few cyclists notice, while one young man on a motorised skateboard takes advantage of the off-peak conditions to whirr by, headphones poised. Road traffic is extremely light - a lone taxi, a delivery van for a small catering company, a limo. Outside the new New Scotland Yard, a larger media circus is in evidence. The Queen was supposed to be here today to open the place, a small item at the end of the news, but instead the exterior is the focus of far wider attention. Only now are the public being allowed into, and out of, Westminster station, where the number of armed officers in the ticket hall almost exceeds the number of customers. There's still no access to the nearest corner of Parliament Square, so police and journalists cluster on the Embankment traffic island. 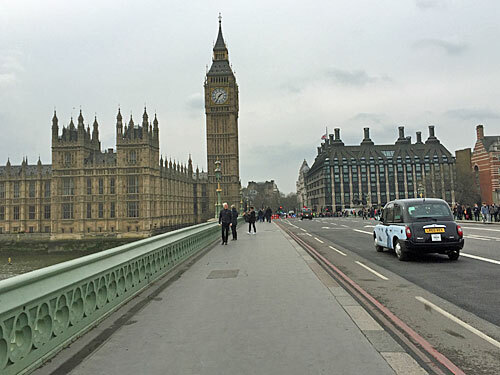 But Westminster Bridge is open, freshly reopened, and virtually empty. All the cars and buses that had been sitting here since yesterday afternoon have been cleared, along with all the evidence that this was ever a crime scene, and the span has the emptiness film producers can normally only guarantee at five in the morning. In a few hours there'll be bouquets, but until then nothing marks the places where, who knew, it wasn't safe to stand. Where bodies lay, where bystanders ran to help, where hastily erected tents shielded the worst of the injuries from view, there's now just tarmac painstakingly swept for evidence, then tidied up, then cleaned. A couple of cars pass by, on the road of course and not on the pavement, and who would ever have assumed the opposite? It takes some imagination to picture this walkway as a inescapable trap, with a line of traffic on one side and the edge of the bridge on the other. Only now is it blindingly apparent how low the parapet is, barely at chest height and all too easy to be manoeuvred over. The waters of the Thames are choppy, and not as far down as you might expect, though far enough at speed. On one of the lampstands a knot of police tape remains. The souvenir kiosk at the eastern end of the bridge remains shuttered. 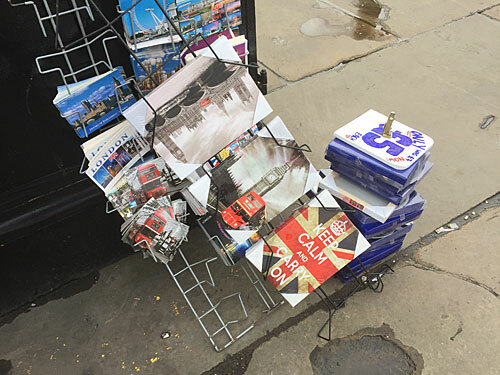 A rack of printed merchandise has slumped onto the pavement, with most of its pockets empty, and the postcards in the others askew. Larger canvases depict the bridge at an unlikely angle, with one red bus prominent on each. The message on the final board is normally a cliche - Keep Calm And Carry On - but today that's precisely what Londoners have done. As cordons clear, a stream of cars, vans and buses arrives. The bridge begins to look ordinary again, or at least will do once the chestnut sellers and card sharps have returned to their pitches. Every effort has been made to return this part of London to normality, a state impressively reattained in less than 24 hours. An unspoken message has been sent out to the rest of the world that whatever you may choose to do to our capital city, life goes on. 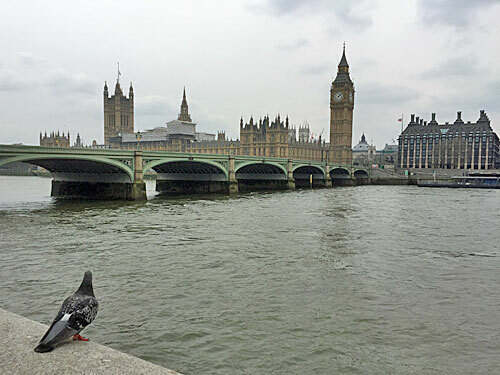 One day we'll be able to cross Westminster Bridge without thinking back to what happened here. We do the same in many other parts of London, the memories of the tragedies that played out dampened by years of familiarity. For now however it's impossible to walk across without feeling the shadow of events cast before you, and pondering what if, and why here, and why? And because it remains impossible to stop a maniac with a car, where next? 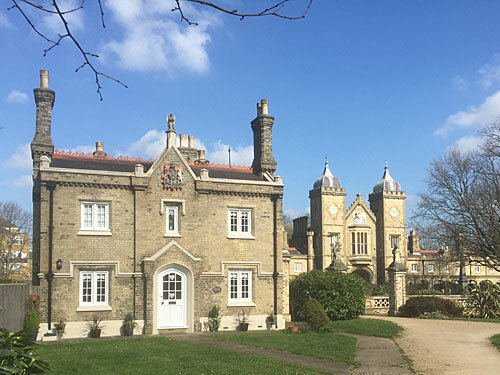 Penge Urban District has an astonishing administrative history, and is the only part of the capital to have been absorbed into London twice, from two different counties. 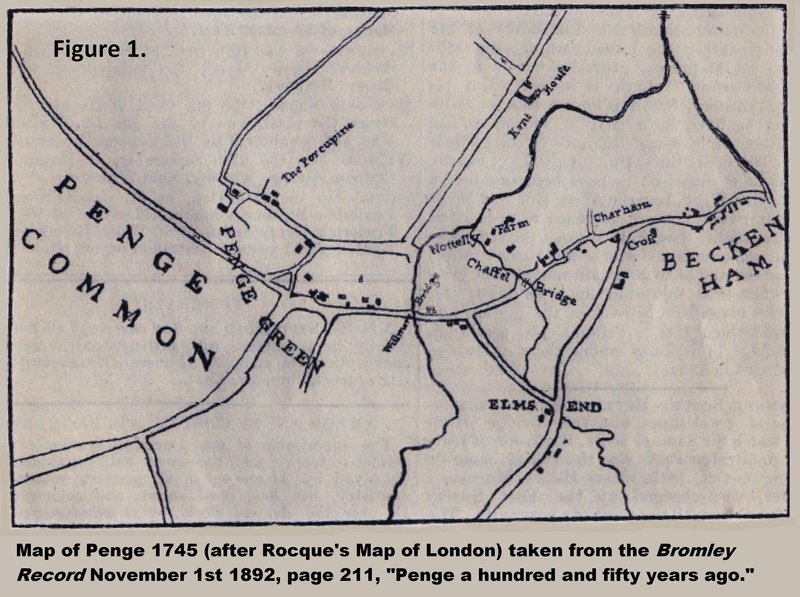 In medieval times Penge was a patch of woodland owned by the tenants of Battersea Manor. As late as 1866 Penge was still a detached hamlet of the parish of Battersea, an exclave of entirely disjoint land administered from four miles distant, and thus part of Surrey. From 1889 it formed part of the new County of London, but in 1900 was transferred to Kent as a separate urban district. Only in 1965 did it return to London, combined with several other districts to create the London borough of Bromley. 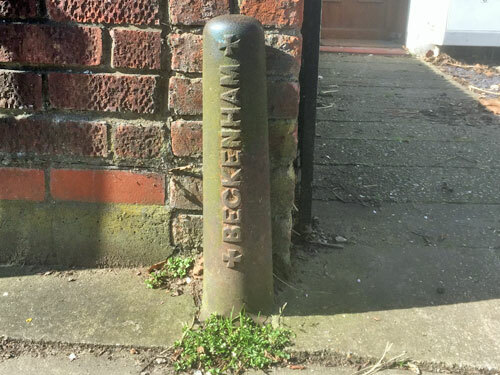 So for today's post I thought I'd walk the boundary of Penge Urban District, hunting for evidence of its mixed-up past, if only I could work out precisely where it ran. 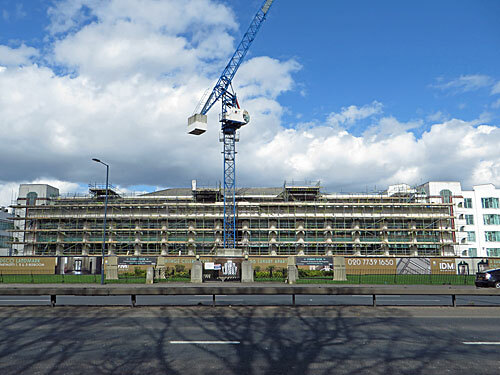 Thankfully Martin Spence, author of local history book The Making of a London Suburb, has detailed just such a walk, in seven detailed chunks, on his Pengepast blog. With the aid of this (and Martin's hand-drawn map) I was able to work out precisely where to go and what to look for, and the end result is this post, which is nowhere near as good as his. I started at the Vicar's Oak, which you may know better as the Crystal Palace crossroads at the top of Westow Hill. Once the point where the parishes of Lambeth, Camberwell, Battersea and Croydon met, this long-lopped tree is still the only point where four London boroughs (almost) meet. 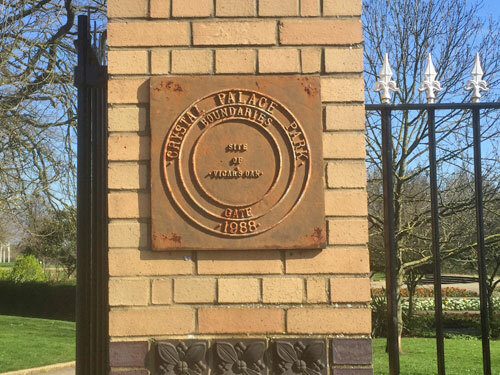 Look out for a memorial plaque on the gateposts at the entrance to Crystal Palace Park. 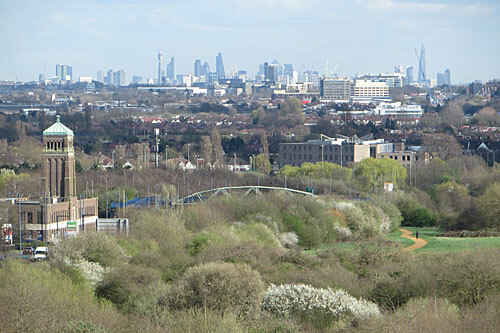 Heading clockwise, the boundary of Penge Urban District followed what's now Crystal Palace Parade, the ridgetop at the top of the park, and still the westernmost edge of Bromley. There's still a mighty fine view up here, just beyond the bus station on the terrace where the Crystal Palace once stood. I paused to soak in the panorama, interrupted by a lady behind me yelling "Come here Toto!" at a creature I assumed was her dog, but was aghast to discover was her toddling son. 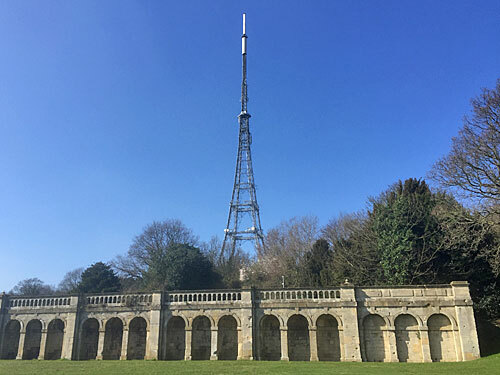 A little further along is the entrance to the Crystal Palace Subway, a stunning vaulted crypt which volunteers hope one day to reopen, and at the far end the soaring Crystal Palace TV mast. London's television is broadcast to your aerial direct from Penge. At the top of Sydenham Hill the boundary doglegs back, and the key road to pay attention to is Old Cople Lane. This was once the main route between London and Bromley, a track along the edge of Penge Common, but today only a stumpy private cul-de-sac remains. This leads to a Caravan Club enclave, and also provides a back entrance to the transmitter compound for those allowed within for maintenance. I couldn't find the metal post marking the corner of Camberwell parish but I did find that for Lewisham, so deeply embedded in modern tarmac that half the 'L' now lies submerged within the pavement. Alongside are the blocked-off gateposts to 'Rockhills', the large house where Joseph Paxton, designer of the Crystal Palace, used to live. He was instrumental in bringing the huge glass exhibition centre here to Penge after its spell in Hyde Park in 1851, and in completely relandscaping the local area to create Crystal Palace Park. 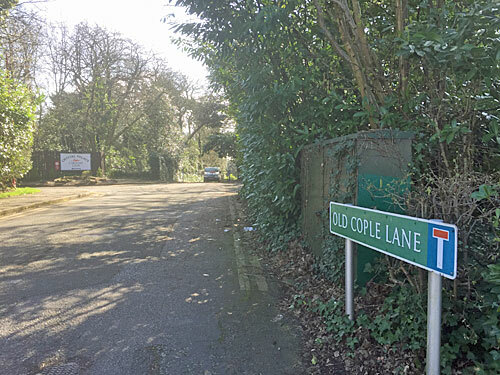 Old Cople Lane therefore disappeared within the ornamental gardens, meaning that the dividing line between Kent and Surrey meandered unseen across the site. 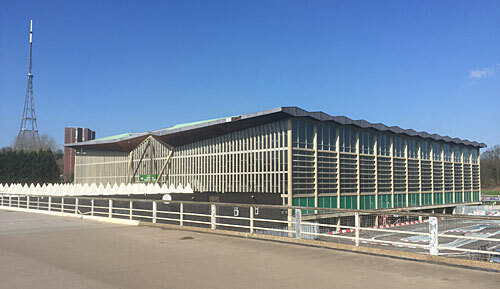 It clipped the tip of the north terrace, then passed south of the labyrinth and through the North Basin, then alive with cascades and fountains, now the Crystal Palace National Sports Centre swimming pool. Only one relic of the former boundary remains within the park, but it's a cracker. 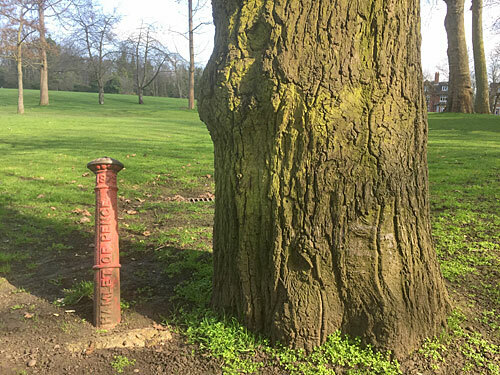 A Victorian red-painted metal post lurks in a clump of trees between the playground and the toilets, down near the cafe on the Grand Centre Walk where it's all too easily overlooked. In raised lettering is the year 1875 and underneath this the legend HAMLET OF PENGE. It sounds epic, as if this oaken glade were once part of some Game of Thrones netherworld. Instead this is simply the location of a slight bend in the edge of a minor parish, which then continued out of the park just to the north of the Penge Gate. The hamlet of Penge Green grew rapidly into a suburb once the railways came, the former Penge Common covered rapidly by housing, with the High Street the heart of the growing settlement. This road is the continuation of what was once Old Cople Lane, with its mid 19th century parish church, the Old Crooked Billet public house and the utterly splendid Royal Waterman's Almshouses. Far more modern is the so-called Penge Triangle, a millennial clock tower with a skirted canopy resembling a pterodactyl, although I'd never have guessed if I hadn't read the plaque. The original boundary divided neighbours on four streets to the north of the High Street, with the consequence that although Penge West station was in the district of Penge, Penge East station lay just outside. On one of these half-and-half streets, Kingswood Road, you can still see a Beckenham parish boundary post in the pavement outside number 55. Neighbouring Mosslea Road became notorious in 1877 for the 'Penge Murder', a brutal case of matrimonial neglect which might have gone unnoticed had not the victim's husband been overheard in the post office asking whether number 34 was in the Kent or Surrey half of the street, because he was uncertain where to report her death. From here the boundary becomes more obvious - it's Parish Lane. Where this bends you'll find the Alexandra Nurseries, opened on the site of the delightfully-named Porcupine Farm, one of a handful of local dwellings in Penge back in the 18th century. There's a lot less of historical interest to report from this point onwards, which'll allow me to speed up a little in my reporting. A right turn is made at the mini roundabout on Kent House Road, just before Kent House station, where it's finally time to head back to the High Street. 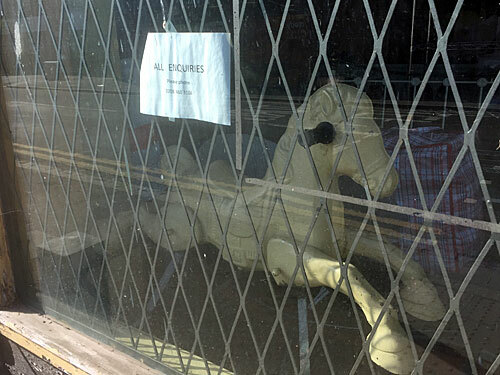 Poor old Bearly Trading on the corner, until recently "Purveyors of Teddy Bears", now not barely trading but closed, with a forlorn-looking rocking horse pushed up against the window. 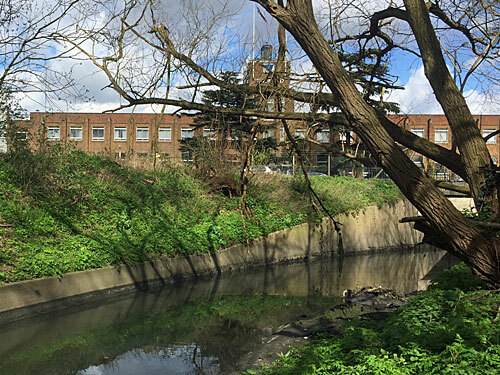 Where Tesco now stands was the site of Willmore Bridge, an ancient crossing where the road to Bromley crossed a tributary of the Pool River. 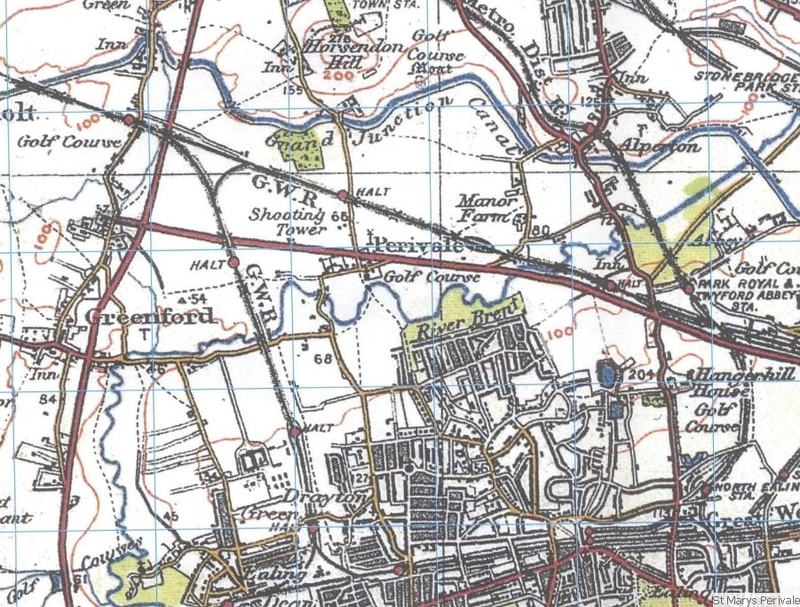 The Willmore's not so much a lost river as a lost stream, but once had the honour (for about a mile) of marking the shire boundary between London and Surrey. 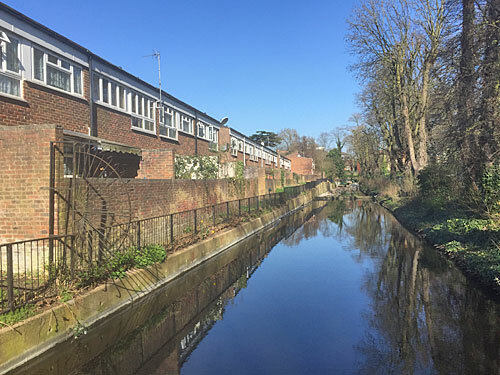 Now culverted, one hint to its existence is the dividing line between SE20 and BR3 postcodes which runs at the bottom of the back gardens between Royston Road and Ravenscroft Road. Another clue is the dip in the land, seen very clearly in Avenue Road, with a brief parapet still evident at the lowest point under which the brook would once have flowed. We've reached prime residential Penge, where large Victorian terraces line broad avenues, and the houses have anodyne bucolic names like Southview, Ivandene or Overdale. At the foot of Croydon Road an old green sign on a lamppost still says 'Penge', despite more modern eyes being more likely to think that the suburb ahead is Anerley. A sports ground and a railway cutting preclude access to the next stretch of boundary, which diverted me into a much more modern estate - a bit of a culture shock after the last five miles. On the bright side I got to divert into Betts Park, where a brief segment of the Croydon Canal survives. It's unexpectedly pretty, although less so at the moment because a retaining wall collapsed a few weeks ago, so council diggers are at work in the drained cut replacing it with a long gabion bank. The diversion also forced me past Penge's town hall, a Gothic confection better known as Anerley Town Hall, or rather now the Anerley Business Centre. Bromley council rent it out to small companies, and hire out the hall, but also transferred the library elsewhere three years ago so the sign out front is wildly out of date. It's a bit of an uphill hike from here to Hamlet Road, down which the parish boundary can reattained. This follows Fox Hill, an ancient track (now residential) and one of the steepest climbs in London. The road sign at the bottom warns 20%, and cars are more likely to edge gingerly down than crawl slowly up. Just beyond the crest the boundary veers off along Lansdowne Road, this juncture marked by a particularly weather-worn parish post. There's one more of these to go, the best of all, outside the front door of a dull block of flats. 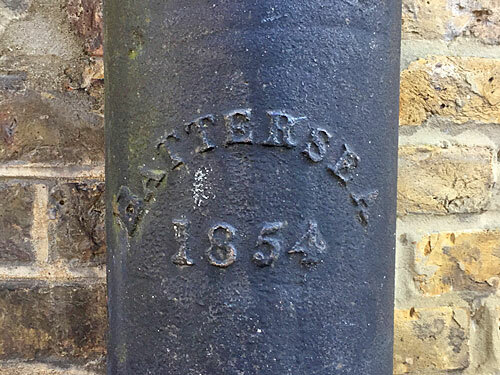 Look carefully and you'll see it says BATTERSEA 1854, a tiny insignificant reminder that Penge was once a tiny insignificant outpost of this Thamesside parish. There's just Church Road to go, one side of the Upper Norwood triangle, where dapper boutiques and artisan chocolate cafes confirm quite how far the edge of Penge has come since all the land round here was woodland, field or common. The circuit is complete at the Vicar's Oak, the point where Kent met London met Surrey, or various paired-off combinations of the above. One day you'll be able to explore the best of the area via the Penge Heritage Trail, a crowdfunded project with the support of the Penge Tourist Board, which launched yesterday and very much deserves wider support. In the meantime let me reassure you that Penge is a lot more interesting than most people think. I know, I've walked its rim. A month ago I told you how badly wrong the eastbound Next Train Indicator at Bow Road station was. But it was at least consistently wrong. If the display said Plaistow then the train was going to Barking. If the display said Barking then the train was going to Barking. And if the display said Check destination on front of train then the train was going at least as far as Dagenham East and probably as far as Upminster. Madness, but consistent madness, should any of Bow Road's waiting passengers ever have taken the time to deduce the underlying pattern. A month later, something has changed. Or rather everything has changed. There is now seemingly no connection whatsoever between what flashes up on the display and where the train is going. If the display says Barking then the train could be going to Barking or could be going further. If the display says Upminster then the train could be going to Upminster or it might not be going that far. I've observed loads of eastbound trains this week, and I haven't been able to spot an underlying pattern at all. Of all the Hammersmith & City line trains that arrived, destination Barking, sometimes the display said Barking but more often it said Upminster. Of the District line trains going only to Barking, half the time the display said Barking and the other half it said Upminster. Of the District line trains going all the way to Upminster, most of the time the display said Upminster but frequently it said Barking. Dagenham East trains are quite rare, but I've seen them flagged up as either Barking or Upminster too. Overall there was only a fifty-fifty chance that the display would give the correct destination for the next train. It was like flipping a coin, no better, no worse. There was even one glorious spell when five consecutive trains came in with the 'wrong' destination. The next stop up the line, which is Bromley-by-Bow, and the previous stop, which is Mile End, have no such issues. They always get the destination right, whereas Bow Road has an electronic tombola on the eastbound platform. What's more it's running to completely different rules to those which applied a month ago, which is doubly strange, and still completely unfit for purpose. 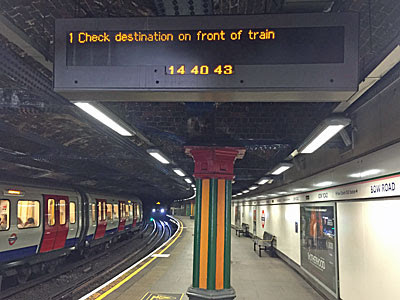 If this Next Train Indicator genuinely can't be fixed, maybe somebody should switch it off.